Here are five lessons that still resonate from labor organizer and songwriter Joe Hill, who was unceremoniously executed 100 years ago today. 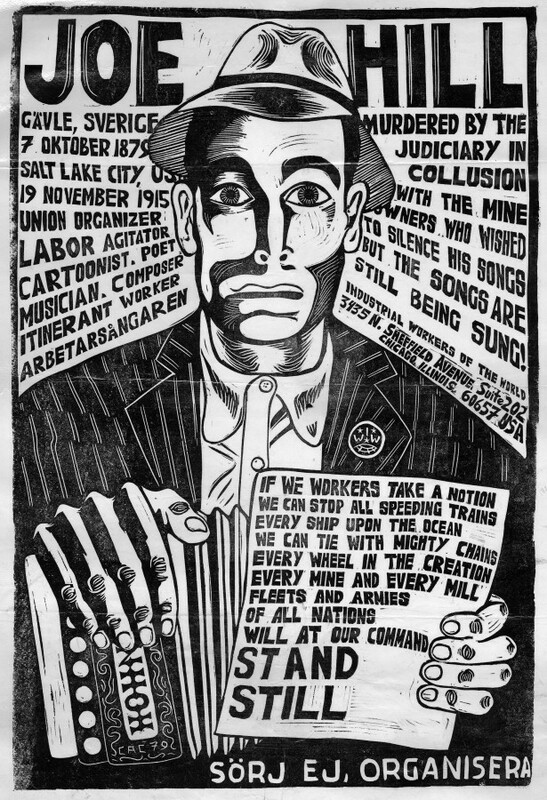 A hundred years ago on November 19, 1915, the song writin’, cartoon scribblin’, parody pushin’ Industrial Workers of the World organizer Joe Hill was unceremoniously executed by firing squad in Utah. Ah, but you might say, the only thing I know about him is that “Joe Hill ain’t never died,” quoting the words of a popular folk song. While it is true that not many folks outside of the embattled labor movement and associated circles know much about Joe Hill these days — that’s a crying shame. Joe Hill’s struggles for worker’s rights, free speech, the right to a fair trial, and against the inequality of our economic order are still significant today. Born in Sweden on October 7, 1879 as Joel Emmanuel Hägglund, Joe Hill left behind a legacy of activist songs as well as innumerable words to live, and die, by. In fact, when the deputy who was directing the firing squad at Hill’s execution said to his men “Ready, aim,” Hill shouted out “Fire, go on and fire!” — calling the shots until the end. He was not only tasking the state, but also the rest of us, to hurry up and act already. Hill came to the United States in 1902 and spent the next 13 years organizing workers and agitating for change from New York to California. As the impacts of labor organizing and the Industrial Workers of the World, or IWW, strikes were felt, the “copper barons” and corporate cronies were not too happy. Government crackdown on the Wobblies, as members of the IWW are known, was personified in the accusation and then execution of Hill for the murders of a businessman and his son in Salt Lake City. At the time, huge national attention was focused on his case, which was murky at best. Hill’s refusal to testify on his own behalf no doubt contributed to his guilty verdict; reportedly, Hill believed he would be worth more dead than alive to the union cause. Given that 100 years later folks are still talking about him and singing his union songs, odds are good he was right about that. It’s also true that Hill managed to organize and agitate even beyond the firing squad. Not wanting to be “caught dead in Utah,” he asked to have his body sent to Chicago where it was cremated. His ashes were then distributed, by mail, in 600 envelopes to IWW members, unions and supporters around the world. Reportedly, some ashes were confiscated by the U.S. Postal Service (and just released in the 1990s), some used in building materials (which still can be found in a wall in a Swedish reading room), some were eaten (most recently by Billy Bragg), and some were scattered at events or on the winds of change in Nicaragua, the United States, Canada, Sweden and Australia. So Hill literally lives on not only in song, but also in other remarkable artists and activists. Here are five lessons from Joe Hill that still resonate today. Hill believed in the power of a united working class, of organizing to fight the system, not other people. He joined the IWW because it was open to all workers — people of color, women, the un-skilled and foreigners, who were excluded from the AFL at that time. The early 1900s were the heyday of the Wobblies, who were very effective at speaking to people about the necessity of banding together in “One Big Union” to wield power against the corrupt capitalist system to create an industrial democracy. Unfortunately, the IWW refused to participate in politics at this time — leaving this arena to more conservative socialists who generally scared off the U.S. public. They also refused to sign contracts with bosses, seeing them as too much of a compromise, which meant they were unable to solidify gains won through strikes. Due to these factors, divisions within the IWW, and severe government crackdowns, membership tanked by the mid 1920s — and the union never recovered. Workers of the world, awaken! Break your chains. Demand your rights. Shall you kneel in deep submission, From your cradles to your graves? Is the height of your ambition, To be good and willing slaves? Arise, ye slaves of every nation, In One Union grand. But a heart in her bosom is beating, That is true to her class and her kind. And the grafters in terror are trembling, When her spite and defiance she’ll hurl. For the only thoroughbred lady, Is the Rebel Girl. In several songs, it was clear that Hill believed that promises of future gain were no substitute for a better life in the here and now. His parody “The Preacher and the Slave,” of a Salvation Army hymn, “Sweet Bye and Bye,” was the origin of the phrase “pie in the sky,” which stands in for a false promise or unattainable goal. You’ll get pie in the sky when you die (and that’s a lie). Thank you Joe Hill, and those that continue to keep his lessons alive by carrying on the work. Thank you for this inspiring tribute. Joe Hill’s enduring message couldn’t be more relevant. Great article! Nice summary of important IWW values still very relevant today. Two points: criticism of the Wobblies’ rejection of electoral politics is overblown. In the Wobs’ heyday, more than half the working class could not vote even if they wanted to. Women workers didn’t win the federal franchise until 1920, immigrant workers weren’t citizens, youth couldn’t vote, migratory workers had no addresses and therefore no vote, Black workers had the vote mostly on paper only. Wobblies had assorted reasons to take ‘political action’ out of their preamble, but it was pretty clear the the Socialist Party (which expelled Wobs from the organization!) and the Socialist Labor Party both wanted the IWW to become adjunct of their groups. And yet, when the IWW was at its height, Eugene Debs got his highest vote totals. Thanks for diving deeper into Wobblie stories. Their work has been inspirational– once upon a time I too was a card carrying member of the Wobblies. Great points about voting rights, too. As far as ‘recovery’ goes, I was referring to the fact that at their heyday in the late 1910’s they were about 150,000 strong; today, they have about 3000 members — a small portion of the USA’s 14.5 million union members. And, you are right that overall union membership in the US is at a low point, with only about 11% of US workers in a union today, compared to the high point of ~35% in 1954– but still, the Wobblies were quite the movers and shakers in the early 1900’s. Most of the recent decline in union membership is about anti-collective bargaining policies adopted in several states, a bald attack on worker’s rights overall, making it ever more critical to keep Joe Hill’s lessons alive! There is more wonderful info at http://joehill100.com . Support the folks who brought you the weekend!